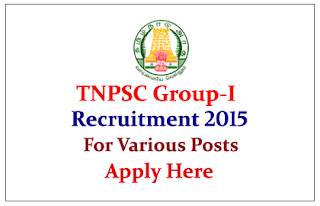 TNPSC is recruiting for the post of Deputy Collector, Deputy Superintent of Police, Assistant Commissioner, and District Registrar. Interested and Eligible candidate can apply on or before 09th August 2015. Company Profile: In the year 1923, the British Government established a Public Service Commission to examine the salary structure of the Indian Civil Service. The Commission was composed of four Englishmen and four Indian with Lord Lee of Fareham serving as its Chairman. The Commission also addressed the rate of Indianization of the Indian Civil Service and the Indian Police. It determined a rate which in fifteen years would make the Indian Civil Service with a fifty per cent Indian membership and the same in twenty-five years for the Indian Police. How to Apply: Interested and eligible candidate apply online on or before 09.08.2015. For more details kindly check official notification.